In June I showed you what my back entrance looked like after my boys came home on the last day of school. I also shared my future plans to finish the area, if you missed that post, you can view it here. Well I’ve finally finished it all and today I’m sharing my coat, hat & shoe storage. When we were building our home, I designed this area and had my cabinet guys make this piece. It’s all one big built-in unit. There are four cubbies, one for each of my boys. The Mr. and I keep most of our shoes and jackets in our master closet. Our work shoes and jackets are stored in the garage. … and a hook that holds each of my boys chore charts. I just added the red and black chore chart to my Etsy Shop, find it HERE. If you missed it, you can view my post on the chore charts HERE. These large bins are from Wal-Mart. In the winter, hats, gloves and scarfs are stored in them. In the summer you’ll often find swim goggles and other summer stuff in them. I labeled the bins using red vinyl cut out with my Cricut and the opposites attract cartridge. The bottom drawers are for shoes. This is the way the inside of the drawers look most of the time. Yes, that’s dirt and grass and everything else that shoes bring in :) To vacuum them out and reorganize them, I probably don’t do that often enough . 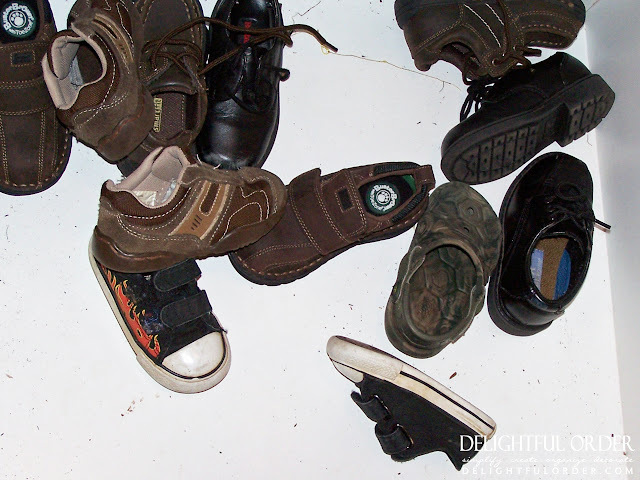 . .
Stinky shoes (like soccer shoes and muddy boots) are stored in the garage. I’ll show you my garage in another post. That is my storage for coats, hats, shoes and such in our home. Make sure to come back soon to see the the reveal of my back entrance completely finished. What a great idea! I wish I had the room to do this! The shoes alone at my house can be a nightmare! This is great! It's wonderful you have the space for this kind of set up. The kids probably like each having their own space. Love this! Are those fabric bins that you put the vinyl on? I wish I had the space to do this in my mudroom.. I love it, and puh-leez... who vacuums as often as they should.. I know I don't : ). OMG could my daughter ever use this for her four girls! Great, great idea! This is so clever! And very cute as well! Great job getting organized! wow! I think you are the first ever blogger who is the most organize I have ever seen. I should learn from you. thanks for sharing! Love this. i so need it!!!! Very nice. I bet the home will be so organised and kids will actually know where to put their stuff when not in use so mommy don't have to look for them every time they are going to use it. that is amazing! Love it! Found your blog through a link party! So glad I did! Your gifted indeed! Love that your lOve JEsus too! I just love how that turned out. I love that you have a big drawer for shoes. Our shoes go every which way even though we have a shoe 'tree' for them. Those bins look great with the vinyl, and I am sure having them labeled will help keep the arguing about who's is who's down. Well, I think you are the first ever blogger who is the most organize I have ever seen. I should learn from you, I am not well organizer but got some idea from your blog to do some sweet and superb. Can you give me the measurements of the unit? I think it would be a great addition to my garage we just finished. Each cubby is approx. 2 ft. wide. The drawers below are approx. 1 ft. deep. Height of entire unit is approx. 92 1/2 inches tall. LOVE this idea, what a great way to organize and look amazing!! I would love to do this in my mud room...did you build the cubbie system or is it something you ordered from a cabinet shop?? I had my cabinet guys custom build this setup for me.